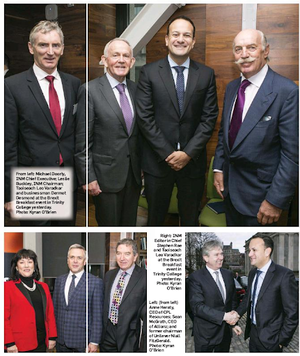 In today’s The Times Ireland edition. A drive to cut hospital admissions during the winter flu crisis was among the publicly funded campaigns that local papers were instructed to present as a news story, The Times can reveal. 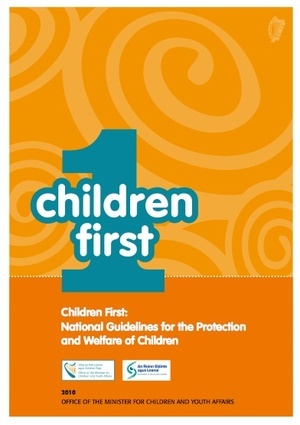 The HSE was given final approval over journalists’ copy during the initiative, run by Mediaforce, the same agency used by the government for Ireland 2040 and Creative Ireland campaigns. To create advertorial content, local newspaper journalists were sent to interview staff at a number of HSE injury units. The interview was arranged by the media agency. It is understood that in at least one case, the journalists had been working in-house while others were freelancers. Mediaforce told journalists that the advertisements should be laid out like a normal news page. Yesterday, The Times revealed that the same firm told editorial staff that advertorials had to look like normal news stories. Correspondence seen by The Times shows that after journalists wrote the interview it was laid out on the page, often labelled as a “special feature,” and the HSE was allowed to request amendments. A British newspaper has denied it is using Facebook data to influence the result of the upcoming abortion referendum. And the newspaper with a London-based headquarters insisted it used the social media platform to promote its stories to all sides of the abortion debate. 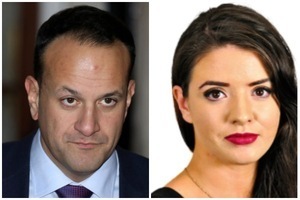 The pro-life side of the abortion campaign has frequently accused ‘The Times, Ireland Edition’ of being biased in favour of repealing the Eighth Amendment. Posted in Misc and tagged advertorials, Ellen Coyne, HSE, Irish Independent, irish times at 12:53 pm on February 27, 2018 by Bodger. The government asked them not to. Hot take: Rupert Murdoch not universally loved in the print game. When will Mr Murtagh emulate his near-namesake in Lethal Weapon and admit he’s gettin’ too old for this soixante-huitard sh*t? ….and the government want to legislate to curb fake news, deceitful liars. Lies and the Lying Liars Who Tell Them! I went through a phase in the early 2000s of buying books like that, and Greg Palast and Michael Moore and could never get far in them because I’d just get so ruddy angry at the carry on of politicians then. In fairness, Holden, I fully believe that Franken’s innocent hands were photoshopped into that honka-honka shot of a sleeping Leanne Tweeden. Completely on a tangent, I was looking through my “The Best American Non Required Reading” book from 2005 (intro by Beck) and read an excellent piece by Al Franken at the weekend. I bought it in the Strand bookstore in New York, feeling about as poop-cool and pretentious as I ever have been. Those “Best American” books are excellent. I’m not sure which is more astonishing, that the government would indulge in this kind of propaganda or that the newspapers are complicit with them. Papers are in the business of filling space with revenue generators and the benighted taxpayers’ money is as good as anyone’s. I suppose this is true in a broad sense. But the individual journalists who work for these papers are people who, I expect, went into journalism with some sense of it being an important public service. The various journos who appear on panel shows and podcasts would certainly give you the impression that this is how they think of themselves; as impartial, objective reporters of important facts, in the public interest. And of course most of the time they aren’t impartial or objective and they don’t do much in the way of public service. Either through laziness or overwork or their own inherent bias. But that’s at least a somewhat nuanced argument. THIS – allowing a government agency to have editorial control of your content – just so dramatically flies in the face of everything that journalism is supposed to be about that it’s baffling to me that the people who work for these papers have been going along with it. 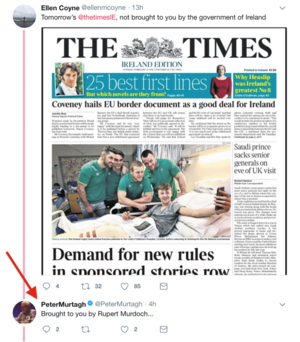 And Peter Murtagh can fupp off with his whataboutery. And the Irish Times daily circulation is now what? Trinity News has a bigger print run. 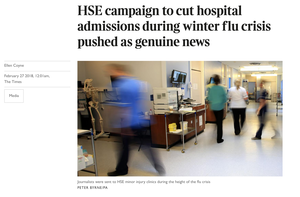 The HSE running a campaign to cut hospital admissions during flu season is wrong, why? Are you dear? There there Never mind.